We are ready for Trick-or-Treating! We made the R2-D2 costume for #1 a few years ago, and it now fits our son perfectly…. which made the choice for the other characters obvious. Click here for more photos from our shoot 2 weeks ago. We wish all you guys get to enjoy time with family and friends this Halloween. Have fun, stay safe, warm and may you get lots of candy. 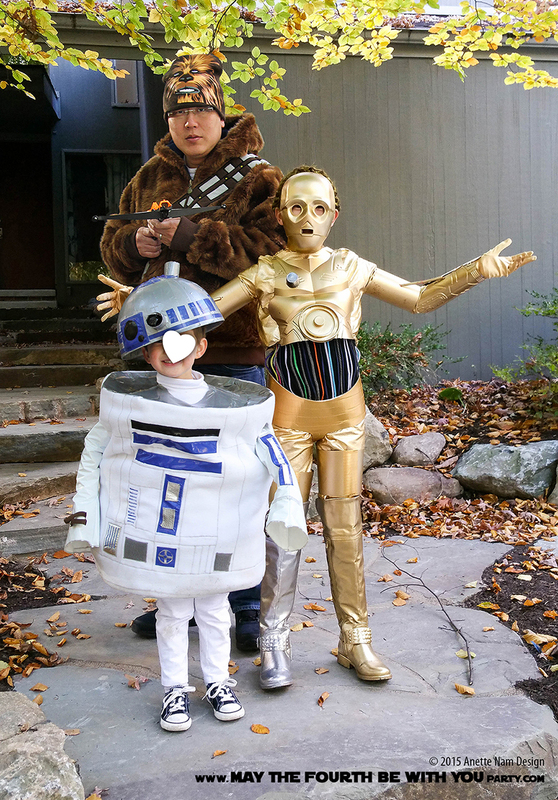 For more photos of the C-3PO and R2-D2 DIY Costumes, click here! Here is our C-3PO DIY post! The detailed How-To’s for R2-D2 are here! You can get the details on the Hubby’s Chewie Costume here. I am starting to look for costumes to make for my kiddos…I CANNOT wait to see how you made that R2D2 costume! My four year old is all over it! You make the cutest things! Thank you so much! The plan is to have the DIY instructions up in Sept. But the really short version is: collapsible net laundry basket (from IKEA) covered in fleece, and a plastic bowl covered in Duct and electrical tape.